Theatrically sized jewellery is the hallmark of Birmingham designer Zoe Robertson, whose exhibition flockOmania opens at The Cass in January. Robertson worked with dance artists Dr Natalie Garrett Brown and Amy Voris to create the oversized wearable objects, which explore the interaction between jewellery, the body and performance. 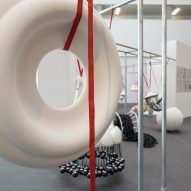 After being exhibited in several incarnations around Europe and China, flockOmania is going on display at London's Sir John Cass School of Art, Architecture and Design – Robertson's alma mater. The exhibition features 15 jewellery sculptures created through a mix of traditional crafts and industrial processes. One slug-like sculpture is a conglomeration of golf-ball-sized beads that drapes heavily across the figure. Another, a disc-shaped necklace, supports a thick cluster of baubles that hang down below the knee. Robert's creations will be exhibited at the art school's Cass Bank Gallery from 9 to 26 January 2017. For the most part, they will be displayed statically, although the exhibition will host two live performance events on 13 and 18 January from 2 to 5pm. At these performance events, dancers will move among the objects, improvising their interactions with them. 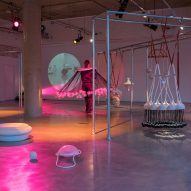 The designer conceptualises flockOmania as more than an installation and performance, however, since it also involves elements of a laboratory and workshop. "The installation space is seen as a laboratory of making in which the dance artists improvise movement and the audience is invited to interact with the work on show," said Robertson. 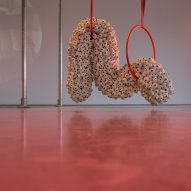 "The interdisciplinary and collaborative nature of flockOmania moves beyond jewellery and into the fields of performance, sound, film, dance and photography." Robertson graduated from The Cass in 1997 with a BA in silversmithing, jewellery and allied crafts. She has since co-founded the studio The Dual Works, based out of Birmingham's Jewellery Quarter. In 2015, London Metropolitan University announced it would be moving The Cass to a newly expanded campus in Holloway, north London, alongside the university's other schools, and would close 19 of its courses, including silversmithing and jewellery design. Photography is by Christian Kipp.